Educators overcome obstacles every day to ensure their students get the best education possible. For Tran Thi Thuy, that meant bringing her own network connection to her rural Vietnam classroom. It also meant investing in her own career so that she could take her teaching to the next level. In just one year, Tran completed courses in 21st Century Learning Design, Teaching with Technology, Teaching with Technology Basics and MIE Trainer Academy Learning Path through Microsoft in Education. But then the real work began. Named runner-up in the Ministry of Education and Training Innovative Teacher Contest, Tran has shared the project around the globe, including in this post celebrating World International Day. Over the course of the project, which focused on the dangers of pesticides in the area, Tran’s students learned to collaborate with educators and experts in Vietnam. They used Skype and Outlook to connect with specialized knowledge, and they collaborated through OneNote Online. They also created PowerPoint presentations, posters and brochures. Tran and her class have become role models for using Microsoft learning tools to teach and learn a language. In true MIE Expert form, Tran has created an Office Mix based on that experience to give general tips. 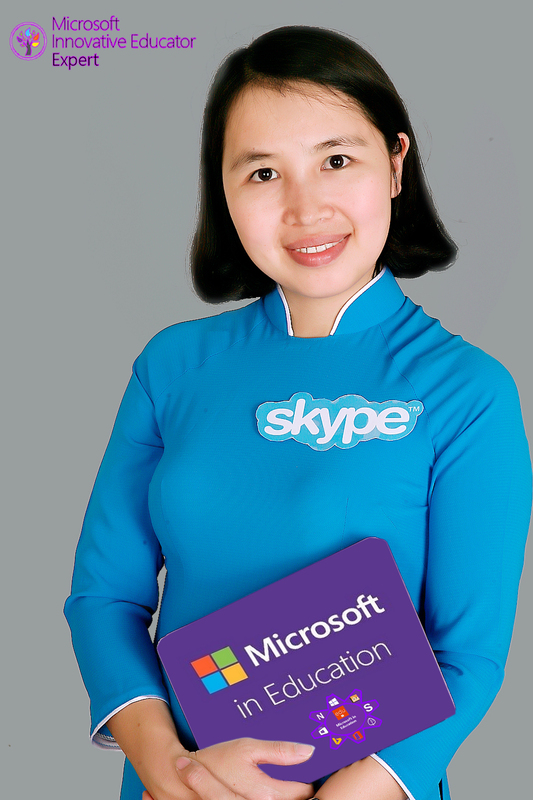 No surprise, she submitted her ideas to the #skypeathon Tips Contest, and was the winner. Learn more about Thuy Tran Thi and her journey to become an MIE Expert here, or connect with Thuy on her Microsoft Educator Community profile. Educational background: B.A, Faculty of English, C1 English Certificate. Favorite childhood memory: I was given a bilingual Sunflower magazine from my cousin at 11 years old, when I knew nothing about English. I was impressed and harbored the dream of being an English teacher because I wanted to open and broaden my knowledge and improve my skills. The only way I learned English was [through] grammar books, doing exercises. The magazine was my treasure to continue to learn. I returned to my hometown to teach my students, and tell them that we can be better if we change our mindsets to do more and learn more. Microsoft tools help me solve problems in my teaching and motivated my students to learn and gain 21st century skills. My childhood [was all about] books and I want my students in my hometown to have more chances to learn and achieve. Favorite book: Multiple Intelligences in the Classroom by Howard Gardner and Change Your Attitude, Change Your Life by Dennis S. Brown. Favorite Microsoft product, tool, technology: Skype in the Classroom, Office Mix, O365, OneNote. This entry was posted in 21st century skills, Change Management and Culture of Innovation, Project Based Learning and tagged MIE Expert, Skype in the Classroom, vietnam. Bookmark the permalink.